My parents got me a version of this on tape for Christmas when I was a kid but the tape was corrupted so I had to return it. Glad I'm finally able to play it 30-some odd years later on an emulator! 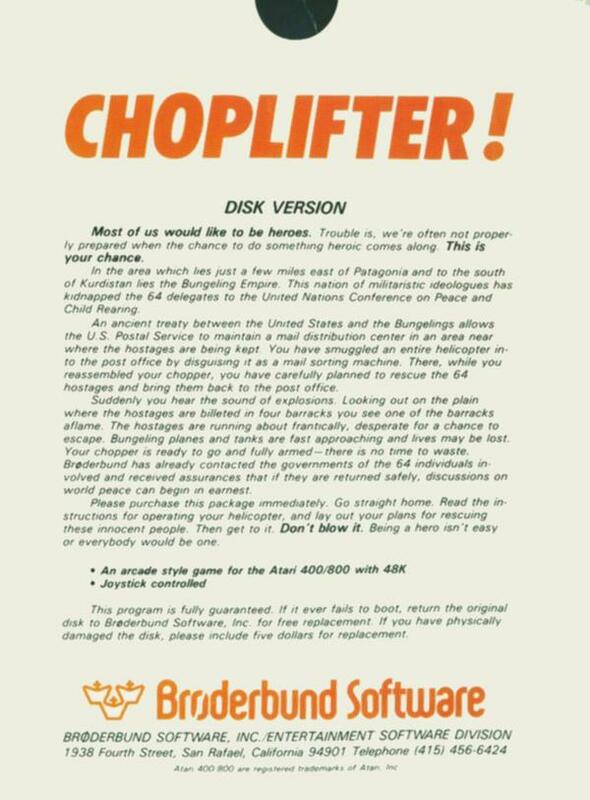 PATCH HACK "Choplifter In The Dark", only 8 bytes edited different, starting with the .XEX version described prevously. Change offsets $AC3 and $ACD both from being #$50 to #00. Change offsets $B46 thru B48 from "8D 18 D0" to become "EAEAEA", and, offsets $B4F thru B51 from "8D 1A D0" to become "EAEAEA". PATCH HACK "Choplifter in 4-color Low Resolution" (having no artifacting), starts with the .XEX version described previously. This is a long patch, many hundreds of bytes, but able to be detailed right here: change 3 colors, offset $AC3 from #$50 to #$38, offset $AC8 from #$0E to #$88, offset $ACD from #$50 to #00. Edit the DLI sequence offsets $B46 thru B5D, from "8D 18 D0 E6 C7 C0 04 90 07 8D 1A D0 A4 C6 68 40 C0 01 F0 08 C0 02 F0 15" to become "E6 C7 C0 04 90 0A A9 C0 8D 1A D0 EA A4 C6 68 40 A9 D2 8D C4 02 D0 16 EA". Lastly, edit the Display List occupying offsets $1809 thru $19D8 changing any byte that is #$4F to become #$4E, change all #$0F to #$0E, change all #$8F to #8E. 1 Many old cracked files have corruption. Choplifter is one of the oldest most "shared" files and yours could've been transfered over modems dozens of times. I found corruption in the old file I was using so I'm glad I did this. 2 cracked file will load instantly unlike this VAPI disk, and file uses less disk space. VAPI is the proper library format for this original game disk which relies on having Bad Sectors. But the original was encrypted. 3 decrypted file can be copied then patched, ensuring patched versions are also without corruption. 4 the Reset button can be trapped (sent to address $0800), whereas the original disk reboots on Reset button. DECRYPTION - the VAPI image itself is like one layer of encryption. If you want to work upon an .ATR image file instead of reading disk sectors inside the Atari, then first convert this VAPI (.ATX) download to a standard 92176 byte long .ATR file, this way: format a new disk without writing DOS to it, then copy sectors 5 thru 248 from .ATX to .ATR, I used the SmartDos menu to do this. The game is made up of the entire contents of sectors 5 thru 248, every one of these sectors is encrypted with a mask that is XOR (aka EOR) using # THE SECTOR NUMBER, all 128 bytes in every sector. Sophomoric algorithm, it being 1982... Within the .ATR image, sector 5 begins at offset $210, all data then follows in the correct order. 248 minus 5 plus 1 = 244 sectors times 128 bytes in each = 31232 ($7A00) bytes of program in the .ATR image, needing addresses assigned to this block to get a working .XEX file, next paragraph. 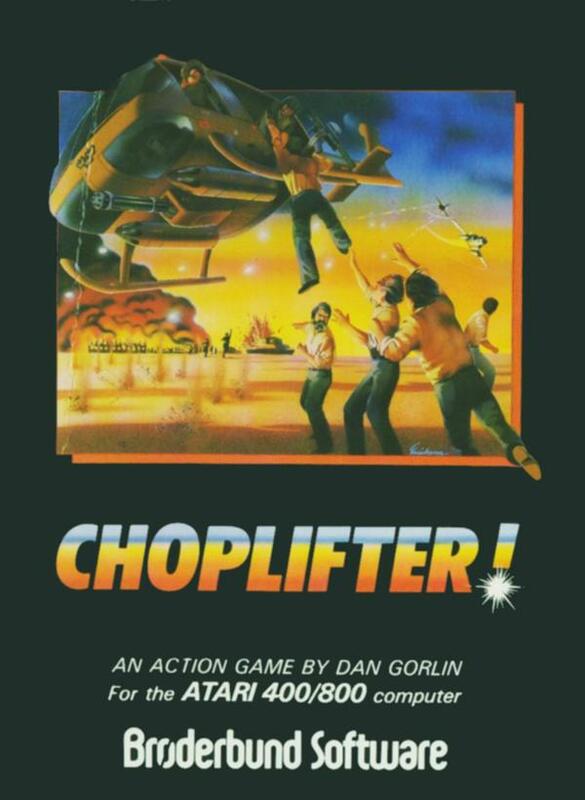 Choplifter! has 3 segments, then the Reset Vector and Start vector, for a total of 5 segments. Sectors 5 thru 54 go into address range $0800 - $20FF, sectors 55 and 56 go into addresses $4000 - $40FF, and lastly, sectors 57 thru 248 go into addresses $6000 - $BFFF. Start the new file with the 6 bytes "FF FF 00 08 FF 20", follow with that decrypted data, 4 bytes next header "00 40 FF 40", more decrypted data, 4 bytes last header "00 60 FF BF", the rest of the game, then lastly, ending with 12 more bytes Reset and start vectors "0C 00 0D 00 00 08 E0 02 E1 02 00 08". New cracked file ends up being 31232+6+4+4+12 = 31258 bytes. The new file is the most elegant having ditched the original LOADER, new file works with emulation just by clicking or RUNNING it, it relies on the emulator itself to act as a LOADER. This game overwrites DOS so can't be launched from most DOS menus, to use this new .XEX file on real Atari, it'd need a LOADER patch added, or a BOOTLOADER, or maybe try many different DOSes one might actually work. Maybe this can be one perceived difference between .XEX vs .COM files ? that .COM is assumed can be launched from DOS menu whereas .XEX might be (in a state of) emulation only. I or somebody else could write a program, an Atari program, which takes the .ATX file for input (loaded into the cassette hopper works fabulously on an emulator), then outputs the corresponding cracked .XEX file. This program could be uploaded and linked here? Next msg I'll tell how to modify this .XEX file to become Choplifter In The Dark, and also, Choplifter in 4-color Low Resolution. 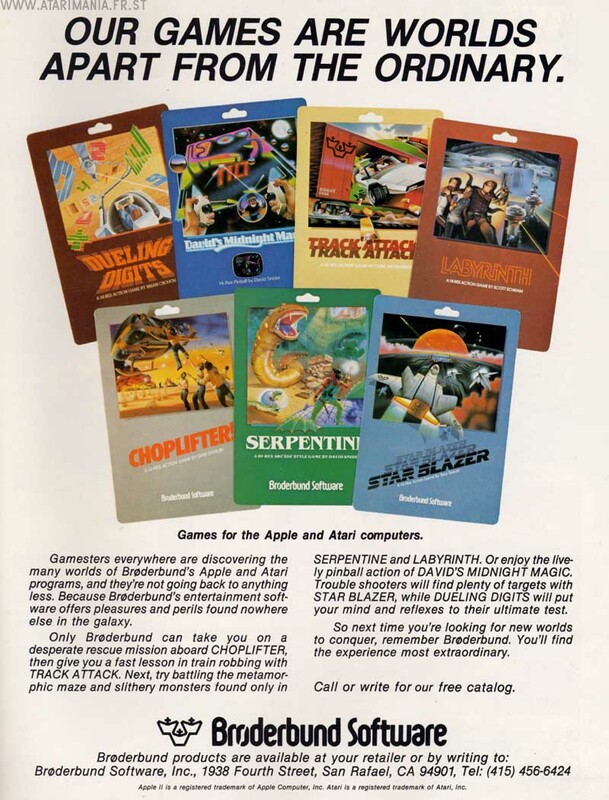 Anyway look at the screenshot in the ad here and it seems terrible when compared to our bigger model 800 games. A 16K model 800 cartridge won't be missed. I suspect the 16K cartridge in this ad is what's known as "vaporware" announced then never delivered. I have 3 entire 1980s libraries from 3 different collectors and none include any 16K Choplifter, I doubt it can be shrunk to 16K and be any good. Did find another variation, bringing the total to 5. First the 1982 original with hi res artifacting plus green and purple smeared all over the screen, 2 a patched original with black sky & low res overlay (red green and blue USA flag), 3 a patched original with all black background for pretend night raid plus maybe look better on PAL hardware, 4 the model 5200 cartridge is neato, and 5 the 1987-88 Atari rewrite for XEGS. I compared them all and I think gameplay is too similar among them to doing any whining about. XEGS added intentional multicolor and better sound, they didn't make gameplay different. More light shown on the emulation bug in the readout panel at screen top. Lots of games draw player missile overlapping artifacting without trouble. The thing causing emulation trouble in this game, and like in those card games, is multiple PMG per horizontal scanline. In Choplifter, the green bars on top and bottom of the readout panel are background color BUT the green bars to the left and right of the readout panel are PMG, so the improperly rendered artifacting with PMG overlap: is situated in between two additional PMG elements. 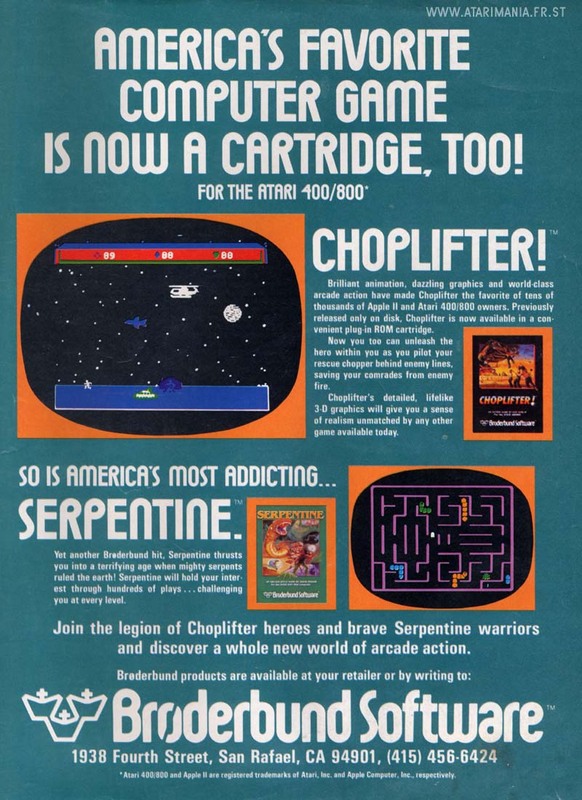 @ rave.N and Jeff, look in the "Ads" advertisements scanned and stored alongside here, you'll see there is or was a cartridge version compatible with atari model 400 which means that version of the program itself must fit in 16k. I've never seen such a version (either) though, and it ain't here on Atarimania at this time. @ Jeff, 2011. The low resolution probably unofficial patched conversion Choplifter is the one you're remembering, it's got black sky and simpler graphics no longer hi res, same fun. But no Choplifter ever ran on 16K, you must be mistaken, the smallest Choplifters are 32K files which might also require a 48K footprint to run in. More recent versions are larger. 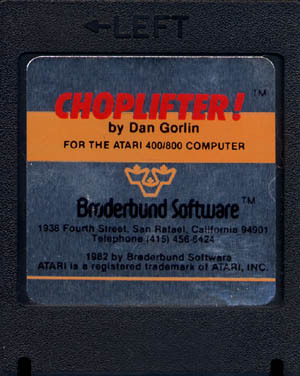 A 5200 model cartridge of Choplifter! was published in 1984, based on the 1982 version, numerous changes like ground color, scoreboard, "!" in the name onscreen, biggest difference in gameplay is separate controls for rotating the helicopter and firing the weapon.! One of those patched low resolution conversions exists too, and I'm not talking about the 1987-1988 Atari Rewrite for model XEGS. When will they stop assigning absurd colors to these patched games, when they could be choosing any colors in existence or else reproducing the original look. Patched low res ver I got does map Blue onto Blue artifact all right, but then they turn the Brown artifact into Green and change the white pen color into a mild Red. The finished product lacks three unique colors for the "traffic lights" in the scoreboard. Traffic lights end up Green, Blue, Green. The USA flag ends up "Red, Green, and Blue." Choplifter! (1982) is another buggy game title in emulation having player missile graphics that overlap artifacting. Look at the "traffic lights" in this screenshot, and you'll see the rightmost lamp circle has a pitch black square (pmg?) behind it, meant to create 3 circles having 3 different colors. But the emulator fails to correctly render the rightmost circle, leaving its square region unartifacted always. 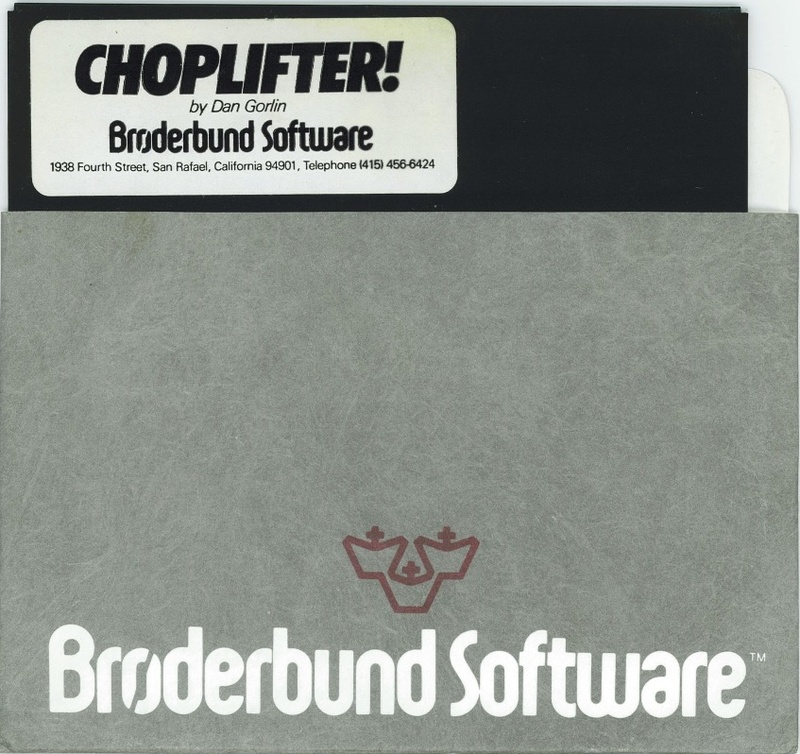 Because the download here is a VAPI disk, I have to go in search of "cracked" versions to be able to test Choplifter on older/other non-VAPI emulators. "Death By Solitaire" is another program with similar problem, failure to do some artifacting when commanded to. One workaround for DBS, switching to OS/A, doesn't fix this Choplifter. Artifacting in this game is blue/brown, the green and purple are background colors. The blue/brown is standard, not reversed, in which case some emulators wrongly say reversed not standard. The embassy or airbase where you bring those rescued, it flies the stars and stripes USA flag. There should be a blue starfield in one corner of the flag, and alongside white pen color, the brown artifact mimics red stripes on the flag. One of many programs that demonstrate overwhelmingly that there is and was only one good way to color artifacting: blue/brown and not reversed! See "Ultima IV" (and "Ultima V") as the "home page" for generalized artifacting talk. 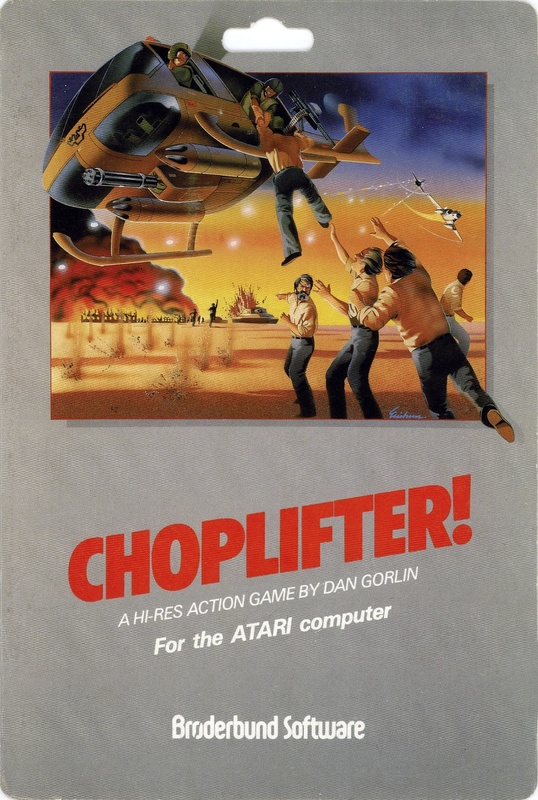 The 1st Choplifter from 1982 never had an ! in its name. The gameplay is pretty much the same in all versions that I have tried (C64, Apple II and Atari 800 XL). I think the graphics tried to create some kind of 'artifacting' color effect, to create solid colors. But it doesn't work on a PAL Atari 800 XL, so the graphics look not only weird, but quite surrealistic and maybe unfinished. Of course there is some artifacting that a CRT television with PAL Atari creates, which doesn't really improve things. Maybe with an NTSC Atari, the colors would look right. Having said that, even the C64's graphics look like Apple II's graphics for some reason (quite an achievement in itself), perhaps for the reason that with certain graphical tricks, you could display more visible colors on an Apple II. That of course doesn't work with the C64, either. So this game is doomed to look 'odd' pretty much on all platforms. The gameplay is simple, but the sprites do not always move smoothly. The more movement there is on screen, the more things slow down. This is also happening in all versions, as far as I can remember. It's kind of fun to rescue the little guys, and this was the first game that made me feel pity as a kid - I pitied those little dudes that happily and desperately waved at me, just before being mowed down by a tank or something. The gameplay becomes very difficult very quickly. 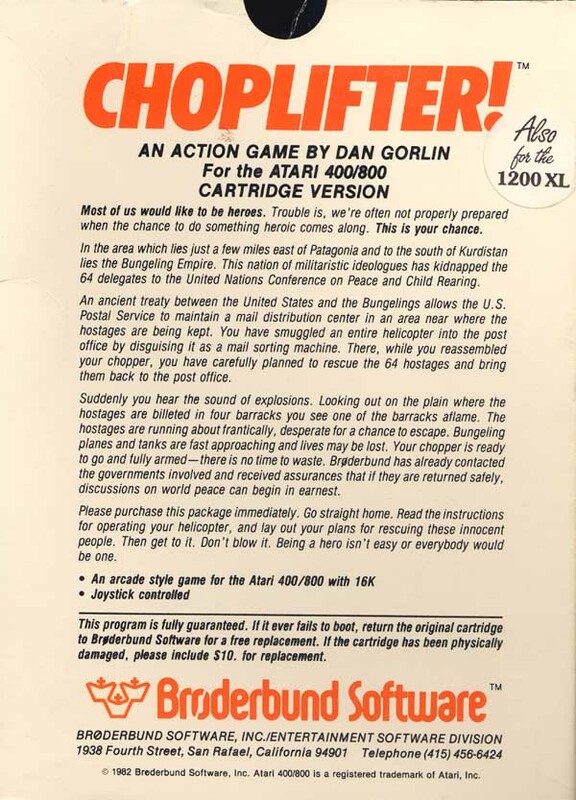 The first 'sortie' is all good, but then it becomes completely hectic by the next, because you have to keep dodging the missiles and destroying the airplanes, and take care of the tanks and destroy the buildings and have time to actually land and collect the guys and then fly back to the other side of the fence. The starry sky is not as atmospheric or cosmic on the Atari version, though, because it's just too blue, and the stars are not bright enough. Still, a fun, simple little game, it's pretty uniform in all platforms, except the Arcade of course. The Atari version is nothing special - nothing too bad, but nothing too interesting, either. And because of the graphics and sound, the C64 version is a bit better. 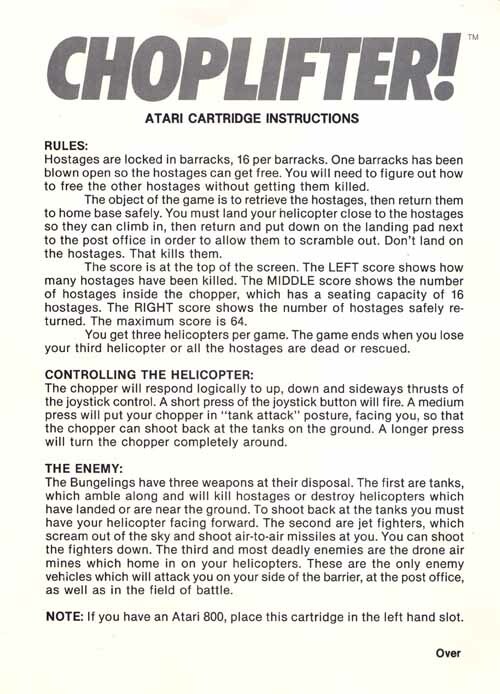 This was one of the first games I bought for my 800 and I liked to play it although the game mechanics (either bombs or rockets) were a bit tedious and it did not take that long to get a perfect score, after which there was no further challenge. Yes, this version will always be the one for me. This was a milestone when it came out, and I distinctly remember being in awe when I first saw the animation in this one. Ah, those were good times. 10/10. 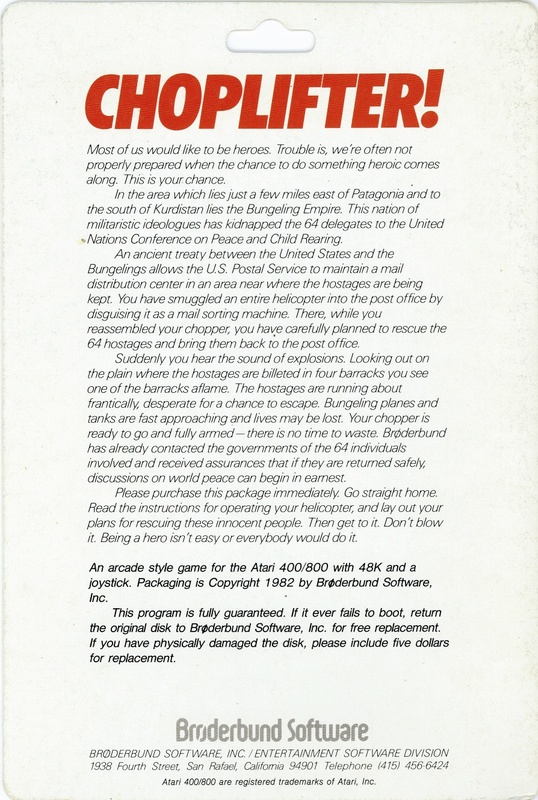 A very timely game, with the memories of the Iran Hostage Crisis still fresh in everyone's minds. IIRC, Gorlin said the game was inspired by the ill-fated rescue attempt. It took me 23 years to finally complete the game with all 64 hostages intact. 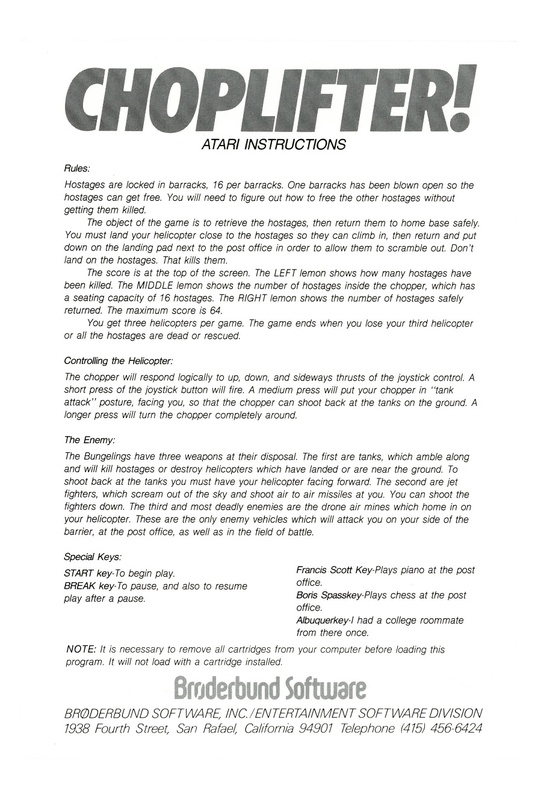 :) Part of the appeal of the game as been mentioned are the actions of the hostages. They wave at you, and if you are unable to take them, they salute you, as if to say, "Godspeed." It might be cruel, but I always liked the animation when the chopper crashed down in a heap of twisted metal. With the hostages aboard, of course! 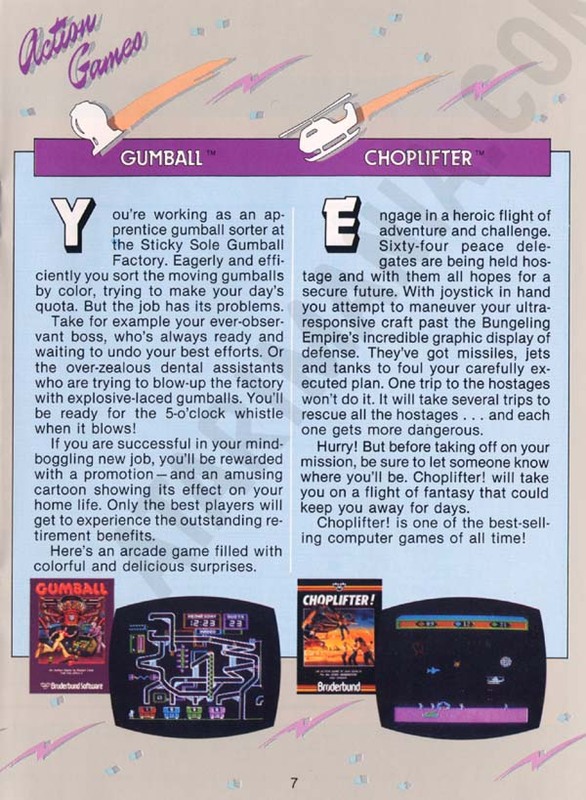 I have this version of Choplifter, great game, great colors, great seting, i love it. Click here for the re-release. 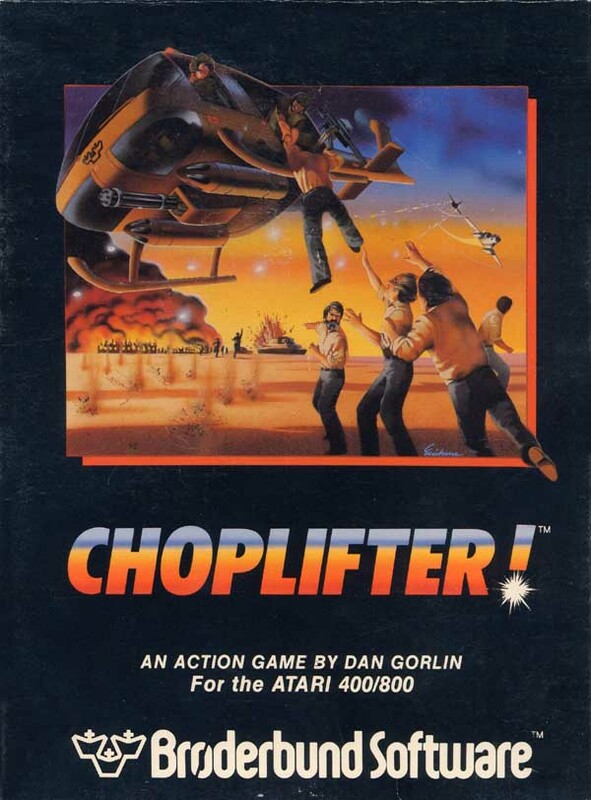 Choplifter! has to be one of the best variations on the Defender theme to date. The object of Choplifter! is to rescue American hostages from burning buildings, where they are being kept prisoner, and bring them across the border to a US post office. This task is complicated by enemy tanks on the ground and enemy planes and drones in the air.